A policy formula the European Central Bank recently described as “remarkable” is suggesting it needs to ease monetary policy once again. A rule designed by former Governing Council member Athanasios Orphanides — praised by researchers at the ECB just after the end of quantitative easing was announced — says policy is now too tight, after months of weak economic data forced the central bank to lower its inflation outlook. The central bank predicts that price growth will average 1.5 percent in 2020 and 1.6 percent the following year, below the medium-term goal of below, but close to, 2 percent. The central bank committed in March to keep interest rates low for longer and announced a new round of long-term bank loans. However, the stimulative impact of the measure is set to remain unclear for months as policy makers are still haggling over the details. The Orphanides rule links changes in interest rates to the gap between inflation projections one year ahead and the target, as well as the difference between forecast growth rates and those an economy can achieve in the long run. The main difference versus the Taylor Rule — which has inspired officials around the world since the early 1990s — is that it doesn’t consider difficult to measure concepts such as the output gap. “Because the rule can be implemented on the basis of short-term forecasts for growth and inflation that were available at the time of the policy decision, it is an easy way of constructing a real-time policy benchmark that is not contaminated by ex-post information,” Philipp Hartmann and Frank Smets, two of the ECB’s top economists, wrote in a December paper, one week after President Mario Draghi put a cap on asset purchases. While neither the ECB nor other major central banks rely on prescriptive rules for setting policy, economists like Orphanides and Stanford University’s John Taylor have argued they are useful tools to evaluate and communicate decisions. The Taylor Rule has lost popularity in recent years because it has fallen out of whack with reality. For the euro area, it suggests a benchmark rate of around 3 percent, instead of the minus 0.4 percent currently in place. Central bankers generally reject a strict adherence to rules as too rigid for complex economies. 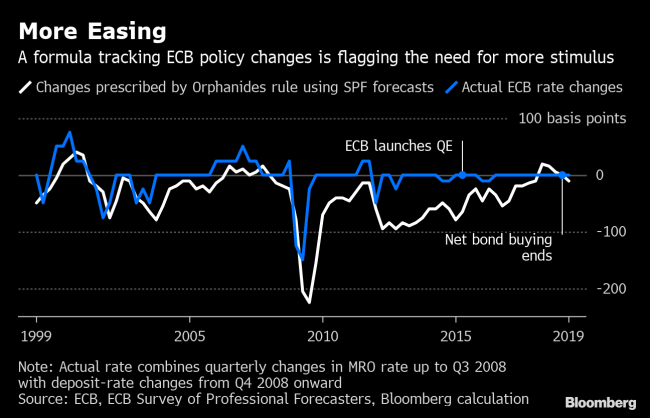 While flexibility is also valued at the ECB where policy makers grapple with slowing global trade, unclear plans for Brexit and softer growth in China, Orphanides sees politics at play.